The Aran Islands today began their participation in what is believed to be Europe’s first practical study on how integrating renewable energy, electric transport, storage heating and other environmental initiatives can lead to a sustainable, cost effective and money saving solution for all our energy needs. The project was conceived by the Sustainable Energy Authority of Ireland and developed in conjunction with Electric Vehicle suppliers Green Machines, Merrion Fleet Management and Smart Metering specialists Klockner Moeller Ireland Ltd. The electric Mega e-City vehicles are an integral part of the Study that will run over the next three years and eight of these unique cars were delivered to the Aran Islands this week. As part of the study the Mega e-Citys will be used as everyday transport by the participants. Their charging patterns and usage of electricity will be monitored and managed through a smart metering system. It is envisaged that when the vehicles are charging, primarily at night, that they will be using energy from renewable sources. The excess power that is stored in the batteries of the vehicles would otherwise be wasted. The eight vehicles will be managed and serviced by Green Machines partners in the Project, Merrion Fleet Management and the Island Co-Ops. 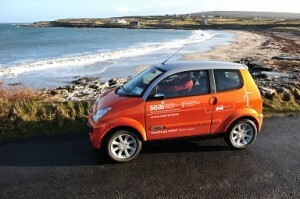 It is estimated that the electricity cost of charging the vehicle on the Islands could be as low as 60 Euro per year. Normal Urban running costs would be slightly higher. It would be approximately 200 Euro to run the car for a year if fully charged every day which is on average about 70% cheaper than the fuel costs of similarly sized Diesel cars. The Mega e-City has no exhaust and zero emissions when driven. Even if you take account of the CO2 produced in supplying the electricity to the mains socket to charge the car, the Mega e-City still has lower emissions than any combustion engine. With renewable energy and carbon offsetting this would be zero in the near future. Motorists can expect to save up to 80% in fuel costs. Since 2001 Green Machine’s have been pioneering the move into electric transport that produces zero emissions when driven. They have been at the forefront of promoting the use of these vehicles not only in the private sector but also in the public sector. The range of vehicles they offer include people carriers, waste disposal trucks, mopeds, maxi scooters, cars and so on. The company believes that the time has come where a switch to emission free transport is now a viable option.